STEELE CREEK GNCC RACING REPORT: PICKENS, STEED, JONES ALL LOOKING GOOD! 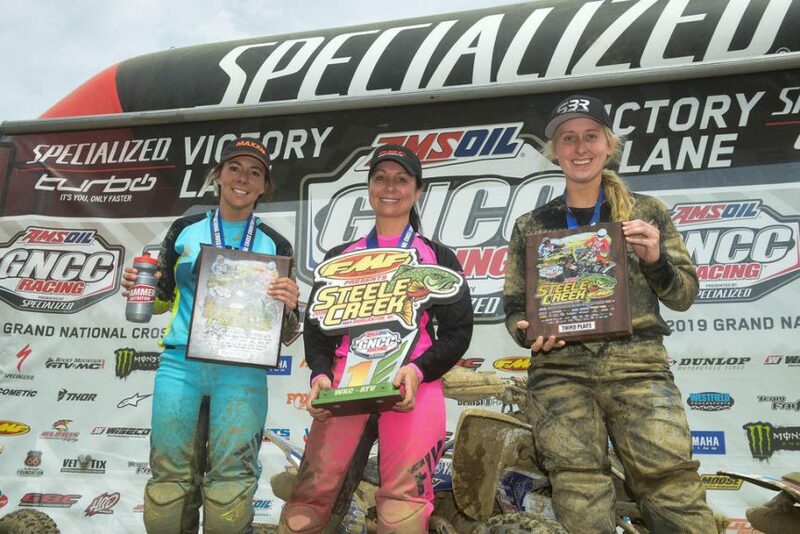 MORGANTON, N.C. (April 8, 2019) – Steele Creek served as round three of the 2019 AMSOIL Grand National Cross Country (GNCC) Series presented by Specialized, an AMA National Championship. It took place March 27 and 28 at the Steele Creek Campground. This race is also known for elevation change, with long uphill and downhill sections. It has plenty of elements that make it a traditional-style off road race. Conditions were perfect for Saturday’s ATV race, and despite morning showers on Sunday, near perfect conditions appeared for the bike race as well. Given that Steele Creek is an immensely popular round, and given the relative tightness as well as the shorter than typical loops when compared with other rounds, lappers definitely have an impact on the racing action at the front of the pack. At this round, a total of 83 women competed, with Traci Pickens and Tayla Jones winning the premier WXC classes. Traci Pickens nabbed the holeshot on Saturday in the WXC ATV class, and immediately took control of the race. By the end of the first lap, she had already put over a minute on Sadie Gorrell, who came through the scoring zone in second, in a train with most of the class on each other’s rear fenders – Megan Shepherd, Katelyn Osburn, Alicia McCormick, Hannah Hunter and Jaida Phillips all were separated by approximately one second. Kassidy Williams, who was experiencing carburetor trouble was about a minute and a half back. Her first lap ended up being her only lap of the race, while Jill Zink, who was likely also experiencing trouble, as she was seven minutes down from the main pack after lap one. Zink eventually finished out the day in seventh place. On the second lap, Pickens kept a consistent lead and was pushing hard for a good overall finish against the 4×4 pros. However, there were plenty of battles taking place in the main pack. McCormick passed both Osburn and Shepherd, who was also passed by Hunter at the same time as a result of a poor line choice made while trying to pass second-place rider Gorrell. Osburn was also able to get around her in a separate pass. It appears that on the third lap, Gorrell began to struggle, potentially with the thick traffic as the WXC riders got into the thick of the lappers, and in their post-race comments several riders mentioned the importance of being patient while working through the traffic. Lap times began to increase, and although Gorell’s increased a little more than average, dropping her from second to sixth place. The lap after McCormick made her pass, Hunter had mechanical problems in that same spot under the bridge. Fortunately for Hunter, help was nearby and they were able to get her rolling again – but not before it gave both Gorrell and a fatigued Osburn enough of a lead to drop Hunter back into 6th for the day. Gorrell placed just ahead of her in 5th, while Osburn managed a 4th, which she admits was largely due to luck, as she was just out there trying to survive and salvage points. On the other hand, third-place finisher Shepherd had a fantastic time, saying “it was a fun race and a hard battle all day. I felt like I changed positions with the other riders a hundred times! I’m super happy to have landed on the podium!” The WXC ATV winner, despite having few, if any, battles throughout the race, also seemed to have a good time, telling us, “The weather and terrain made for a perfect race day.” Pickens had a great overall finish, placing fifth overall out of 231 riders. In the Girl’s ATV class, the podium was once again identical to the previous two races – Andrea Rodgers taking the top spot, with Alexis Keys in second and Hannah Moore in third. The battle between Rodgers and Keys was not as close this time, with Rodgers steadily increasing her gap over the pack. Additionally, Morgan Johnson competed in YXC1, taking home a 5th place finish in-class and overall. In the Women’s ATV class, Sydney Sams finished on top and was 60th overall. On Sunday morning, Tayla Jones grabbed the holeshot in the bike WXC race, with Brooke Cosner, Korie Steede and Becca Sheets close behind. Sheets quickly passed her way up to third before entering the woods, making it up to second not long after. Archer worked her way into third, and towards the middle of the lap Mackenzie Tricker, who had crashed in the first couple corners, was nearly within sight of Jones and Sheet. Meanwhile Archer, Cosner and Steede had a second pack of their own but were all closing in on Tricker. Unfortunately for that second pack, chaos arrived towards the later part of lap one in the form of lapped riders. The short course and increasing speed of the WXC class tend to make it tricky for all riders involved. With slower riders in front of them, Cosner, Archer and Steede managed to stay relatively close to Tricker through the scoring zone. The remainder of the top ten were even further spread out, with Shelby Rolen in seventh, Shyann Phelps in eighth, Annelisa Davis in ninth, and Lindsey Bradley in tenth, each separated from the others by a minute or more. Despite her best efforts, Tricker was unable to make up ground as the lead pack grew increasingly distant. It initially appeared that Archer or Cosner might challenge Tricker for the final podium spot, since all three were in the similar unfortunate position on lap one, but Archer lost her brakes, while Cosner struggled with arm pump from the second lap onward. Archer ended up fourth for the day, two minutes down from Tricker, while Cosner was another minute and a half down from her in the fifth place position. Jones and Sheets had an epic battle, staying within seconds of each other, through the entire race and while fighting through masses of lappers. The cleverness and speed of line choices as well as the focus required in such difficult conditions made Steele Creek a mentally challenging race. It is incredible that the leaders were able to stay this close together for the duration. After the race, Jones stated that “Steele Creek is always a hectic one, but in the end I got the win so I’m happy about that.” Sheets agreed that it was “very mentally challenging race” and says, “I am happy to finish with a second place and ready to keep pushing.” Jones and Sheets also went one and two in the overall, out of the 649 riders in the AM bike race. Tricker made her way to the WXC podium in third. In the Girls class, Nikki Russell was back again with the win, although not with quite the same staggering gap as the previous round. Gracie Gooch placed second, while Ellie Winland rounded out the podium in third. Prestin Raines competed in YXC1, placing 11th in class and 23rd overall. Jocelyn Barnes won her third Women’s class race of the year, placing 56th overall. Taylor Murray, from Huntersville, North Carolina was the winner in Women’s C with a 375th place overall. For the Micro races, there was an impressive female turnout. In the Micro ATV division, Khyler Davis had an impressive 4th place overall. The other five girls competing were Zoey Hawkinberry (18th overall), Grace Bender (20th overall), Paisley Wooley (22nd overall), Raelynn Dickerson (24th overall) and Kenlee Wilson (27th) In the Micro Bike division, four girls competed – Maci King (38th overall), Brooklyn Harrison (43rd overall), Paisley Harris (49th overall) and Isabella Yoho (53rd overall). Steele Creek was round two of the eBike racing. In the Women’s class Ashley Hendershot, piloted her Specialized eBike to a 33rd overall finish in the eBike race. The next round of the 2019 AMSOIL Grand National Cross Country Series presented by Specialized will take place this weekend, April 13 and 14 in Society Hill, South Carolina with the Camp Coker Bullet GNCC. ATV and Micro racing will take place on Saturday while Bike racing will take place on Sunday. For more information on the GNCC series, visit the official website at www.gnccracing.com or call (304) 284-0084. Join the conversation on the series Facebook page, follow us on Twitter and Instagram, and be sure to always hashtag #GNCC. The AMSOIL Grand National Cross Country Series (“GNCC”) is America’s premier off-road racing series, featuring motorcycles, ATVs and Side-by-Sides, for men, women and children of all ages. Founded in 1975, the 13-round championship is produced exclusively by Racer Productions. Cross-country racing is one of the most physically demanding sports in the world. The grueling three-hour GNCC races lead as many as 2,400 riders through trails ranging in length from 8 to 12 miles. With varied terrain, including hills, woods, mud, dirt, rocks and motocross sections, GNCC events are tests of both survival and speed, drawing talent from all over the United States, Central America, South America, Europe, Japan, Australia and New Zealand. GNCC Racing is televised on NBC Sports and RacerTV.com. 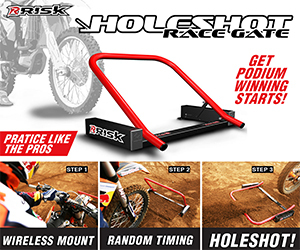 For more information, visit www.gnccracing.com. Founded in 1924, the AMA is a not-for-profit member-based association whose mission is to promote the motorcycle lifestyle and protect the future of motorcycling. As the world’s largest motorcycling rights and event sanctioning organization, the AMA advocates for riders’ interests at all levels of government and sanctions thousands of competition and recreational events every year. The AMA also provides money-saving discounts on products and services for its members. Through the AMA Motorcycle Hall of Fame in Pickerington, Ohio, the AMA honors the heroes and heritage of motorcycling. For more information, visit www.americanmotorcyclist.com. Not a member? Join the AMA today: www.americanmotorcyclist.com/membership/join.